The most popular type of traditional yacht for the "Blue Cruise" is the gulet. The traditional Turkish Gulet is a handmade vessel crafted from wood by highly skilled master craftsmen. Also known as motor sailors, Gulets are extremely comfortable and ideal for long sea voyages as well as inshore coastal trips. 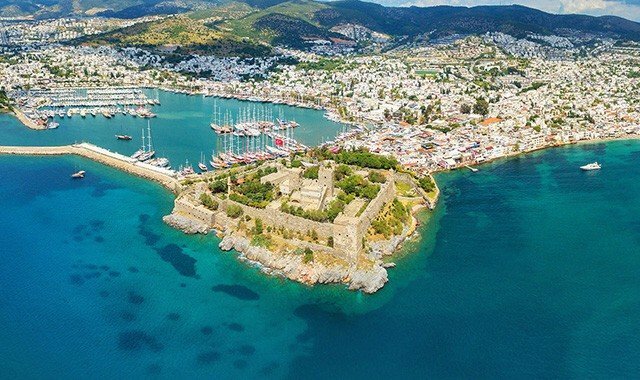 The origin of Gulets can be traced back to the Bodrum area in Turkey but the growth of a demanding market led to their construction being started in Bozburun, Marmaris, Fethiye and Istanbul. High quality and durable wood such as teak, maun and iroko are chiefly used to construct beautiful and sturdy Gulets. Gulet: The most popular type of traditional yacht for the "Blue Cruise" is the gulet. It is a cruising yacht with large, rounded stern area which is well-suited for comfortable eating and lounging. Gulets usually have ketch (marconi) or schooner-rigging, with one, two or three foresails. Their lenghts change between 15 to 55 meters and they accommodate 6 to 24 persons in 3 to 12 cabins with private shower and WC. Aynakic (Ketch): It has a raised, squared-off stern that allows space for additional cabins below compared to a gulet. There may be a large master cabin at the stern. They accommodate 6 to 24 persons in 3 to 12 double bedded cabins with private shower and WC. They are generally ketch (marconi)-rigging and measure 15 to 55 meters. Tirhandil: It is the oldest type of local wooden boat with a pointed stern which is suited best for sailing in Aegean waters. Originally most had lateen sails; now the rigging varies from sloop to cutter to gaff. They normally measure between 11 to 24 meters in lenght and accommodate 6 to 10 persons in 3 to 5 double bedded cabins with private shower and WC. 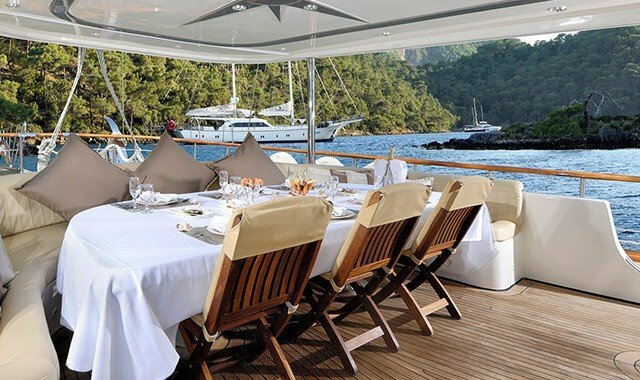 Gulet Yacht Charter: Charter a Gulet Yacht to enjoy a luxurious private holiday at sea with your family and close friends. Whether you choose to hire a traditional, classic, luxury or super luxury Gulet Yacht to suit your budget, you can look forward to a memorable vacation experience that will leave you wanting to come back again! 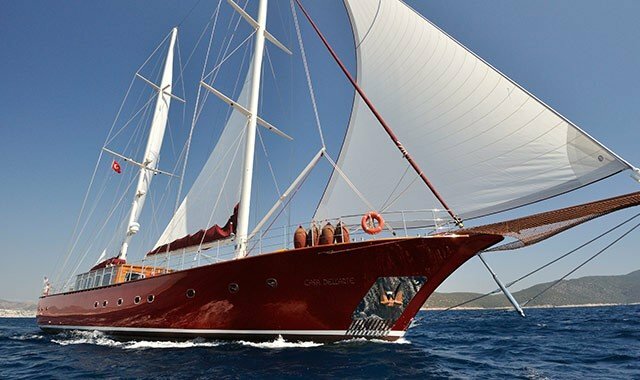 Cabin Charters : Could not hire the entire Gulet for yourself? Do not worry! 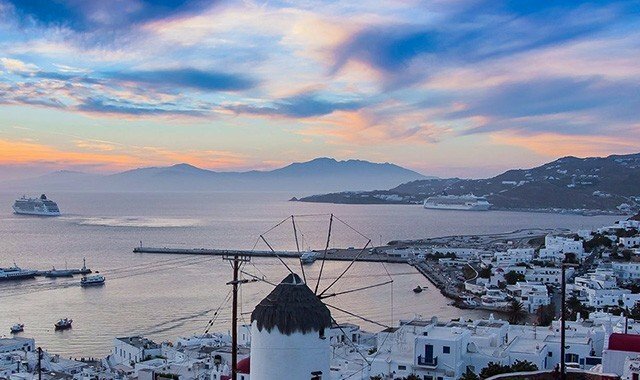 You can still make the most of your holiday by hiring a cabin charter to share a beautiful cruising experience with your family or friends or expand your network and make new friends on board! The design of traditional Turkish Gulets has indeed evolved along the ages and a modern day Gulet is a plush and comfortable blue cruising boat varying from 11 to 55 meters (36-180 feet) in length. The length of the Gulet is proportional to its passenger capacity. Gulets are furnished with great taste and style to offer maximum comfort and facilities to the passengers on board. Each standard cabin in a Gulet has portholes, wardrobe, mirror, air conditioning system, en-suite shower and WC. Master cabins are furnished beautifully with sofa sets, dresser, work desk and Jacuzzi or hydro massage shower to pamper the guests on board. There are separate cabins for the crew. The deck area is exceptionally spacious and complemented by the finest sailing equipment, sun mattresses and cushions so that passengers can enjoy a pleasurable vacation at sea! Whether the guests want to bask in the sun or enjoy adrenaline-pumping surfing at sea, there are all sorts of arrangements available on the charter for them to avail and spend their time. Passengers can also relax at the large aft deck that is furnished with a comfortable aft traditional deck sofa or enjoy fine dining in spacious salons in the dining area or simply lounge about in the beautiful and fully equipped galley. Passenger safety and comfort are of top most priority on the Gulets. Each Gulet has abundant storage of fresh water and fuel. Additionally, there are VHF radio, GSM telephones, full navigation and safety equipment such as life raft, life jackets and fire extinguishers as well as TV and DVD player, refrigerator, ice maker, deep freezer, fully equipped galley and joker boat that help to curb any crisis and allow you to enjoy your vacation at sea to the fullest.